50 Fast, Flea Facts! Check out this selection of our favourite quick Flea Facts! How big can fleas get? See our picture! 13 – Fleas range in size from as little as 2mm up to a whopping 1.4cm! See our picture below of a sand flea found in the UK! 17 – Fleas can jump 150 x their own body length! 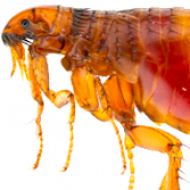 19 – The human flea is mostly found on pigs! 47 – The dog flea and cat flea are probably more likely to be found in your home (if you have pets) rather than the human flea, unless perhaps you’re a pig farmer! 49 – Flea bites are often found in clusters, round the ankles and legs – see our flea bite page for examples! 50 – The most common treatments for rabbit fleas are powders, combing and sprays. Teach Facts, Study Facts, Enjoy Facts!